Last updated by Shari Harley at May 29, 2018 . 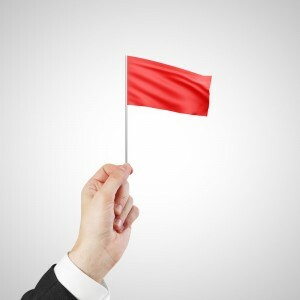 Every time I ignore the red flags I see when interviewing a candidate, or when I feel an employee is struggling, or a project is off track, I pay the price. Every single time. You interview a candidate whose commute will be 75-minutes each each way, but she says she likes to drive. Sure, until it snows. Move on. You haven’t gotten an update from a project team in over a month, but this group is typically reliable, so things are probably fine. Check in. Even the most diligent employees need accountability and attention. They call them red flags for a reason. If you suspect a problem, there likely is one. Don’t just wait and ‘see how things go.’ Make a hard decision, get more information, or get involved. Wait and see is often a recipe for disaster. Sometimes we don’t get involved because we don’t have the time or want to focus on other things. Other times we just don’t trust or listen to our gut. I usually know what I want and need to do, both personally and professionally. Yet I tend to ask LOTS of people for their opinions of what I should do. I solicit advice from friends and colleagues, and in the end, I usually do whatever I want. Why not just trust that I know the right thing to do and just do it? Dad, are you reading this? See, I listen. My dad tells me all the time to stop soliciting opinions, I often ignore anyway, and just act. 1. Become very clear about your desired outcome. Decide what you want. 2. Eliminate distractions. Get quiet, aka, still your mind. 3. Think about the situation at hand. Weigh the facts and your options. 5. Act on your decision. 6. Don’t look back. Your initial decision is usually the right one. Trusting and listening to ourselves can be hard. Perhaps it’s the fear of making a mistake or being wrong. Chances are you’re right. So pay attention to the red flags, trust yourself, and listen to your gut. Employees appreciate perks – good coffee, an onsite gym, concierge service, and workout classes. But none of those things motivate employees to stay with an organization. And no one will quit because a company doesn’t offer those perks. I won’t tell you not to offer yoga classes or to get rid of your video games. Just know neither perk is resulting in employee retention. There are really just a few things employees need to stay with your company and do good work. And if you do those things consistently, you’ll see your best employees stay and excel. Employee retention idea #1: Managers, get to know employees better. Ask what brought employees to your company, what would make them leave, what employees want to learn, and what type of work they really don’t want to do. And when it’s possible, remove responsibilities employees don’t want to do, and replace those tasks with things employees enjoy more. You can’t eliminate all aspects of a job that employees don’t like. But people won’t stay in a job for long that doesn’t let them do work they enjoy about 75% of the time. Employee retention idea #2: Managers, meet individually with employees, twice a month, for at least 30 minutes, to discuss current and future projects. Give specific and balanced (positive and negative) feedback during each meeting. Even the most independent employees need regular feedback and one-on-one time with their manager. Employee retention idea #3: Teach and coach employees, so they expand their skill set and approach challenges in new and different ways. Most employees want to learn and grow. Managers don’t have to do the training themselves, just ensure it happens. Employee retention idea #4: Give employees exposure to the senior leaders in your organization. This includes: attending meetings where senior leaders are present; pitching ideas to senior leaders; and learning from people above the employees’ manager. Employee retention idea #5: Give employees stretch assignments and the chance to learn new things. One of the greatest reasons for employee turnover is boredom and a lack of growth and development. You don’t need to rotate or promote someone to help them grow. Giving employees exposure to different departments and types of work will allow employees to expand their skill set. Most employees want to work for a manager who cares about them, takes time to get to know them, and helps advance their career. These activities will take some time. They won’t take a lot of money. Perhaps have your next one-on-one at the foosball table or over espresso. But know that the time managers take with employees, trumps every perk, every time. Employee retention idea #2: Managers, meet individually with employees, twice a month, for at least 30 minutes, to discuss current and future projects. Give specific and balanced (positive and negative) feedback during each meeting. Even the most independent employees need regular feedback and one-one-one time with their manager. Employees leave managers not jobs. We’ve all heard this 100 times. One of the most prevalent reasons for employee turnover is boredom and lack of growth. We’ve also heard this many times. 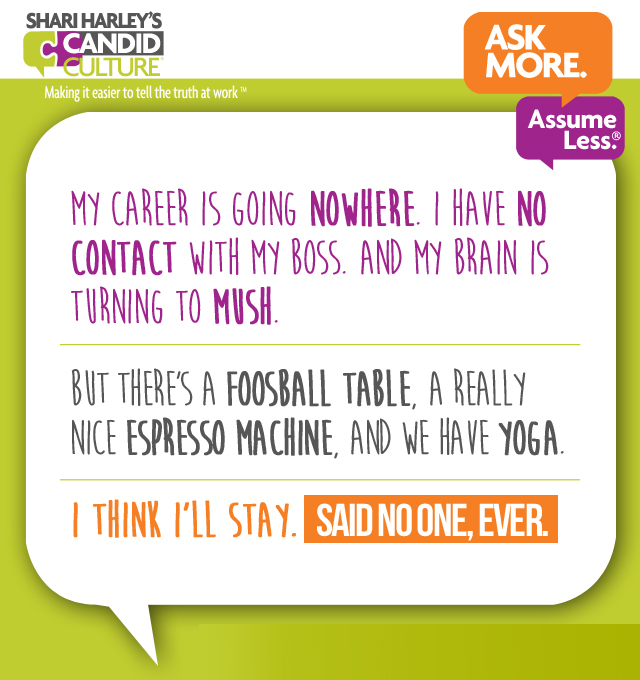 We know why employees leave jobs. The question is what must managers do to engage and retain their best people. The answer is actually quite simple, although possibly not easy to execute. In other words, employees need attention, and attention requires time, time many managers may not feel they have. Managers, how do you make time for these meetings when are busy and have several direct reports? Ask direct reports to send follow-up notes of decisions and plans made during meetings. Give some of the accountability away. If meetings get cancelled, reschedule as soon as possible. Direct reports take cancelled meeting personally. Cancelled meetings, that are not rescheduled, send the message that managers don’t care about employees and their careers. Offer to meet with your manager via the phone when it’s convenient for him/her. Leverage commute and travel time. Employees need time with their managers. Meaningful discussions and work result in employee engagement and employee retention, so managers, make the time, even when you don’t feel you have it. Ask questions you don’t ask now. Give feedback, even if it’s uncomfortable. Give your employees an opportunity to do the work that interests them most. And watch your employee engagement and employee retention improve. 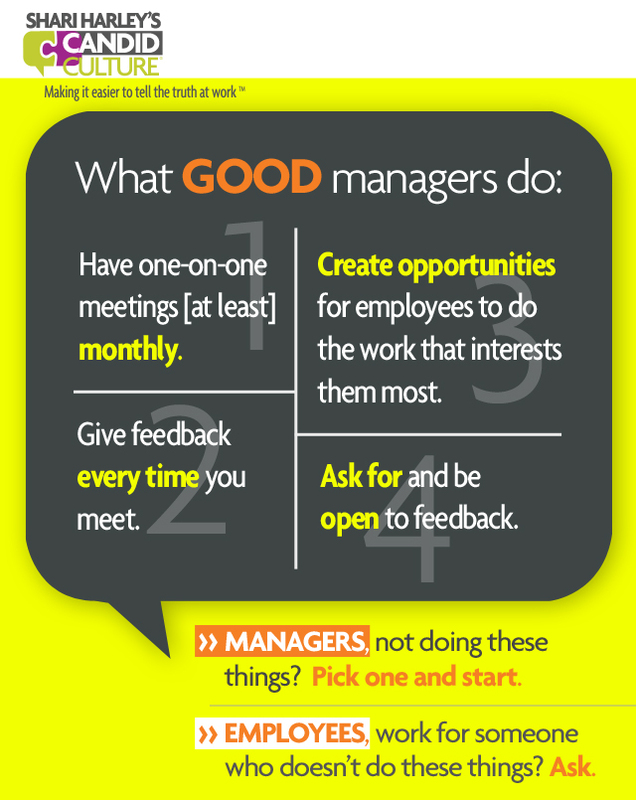 And if your manager doesn’t do these things, politely and persistently ask. You won’t get what you don’t ask for. We are all 100% accountable for our careers.